If you remember, I talked about how I wanted to take pictures of my tree all lit up but didn't want to post them as they looked demonic. Well, Christmas is over and now I will show you. The tree is lovely in real life but in photos it just looks too red. These are the good ones there are worse photos I still won't show. My daughter finished her Nutcracker. To bad she forgot to tell me it was due the day before vacation so now it is late even though it is done. I think she did a great job on it. When she gets it back from school we will have it framed in a shadow box hard to tell in the photos but this has a lot of depth to it. She has the second round of awards on Tuesday night. She doesn't know yet, but she did win again. Not for her Russian Needle punch but for her chalk drawing. One of these days I am actually going to see that drawing because she completed it at school and entered it without me ever seeing it. Her Russian needle punch is in 3D art and there isn't a division of that at the State level of the Reflections program, so it was stopped at this level, I think. She will have fun with the awards ceremony as the mayor of our little town will give her the award. Pretty cool for a 7 year old. To see all the posts on my daughter's Russian needle punch go here. Update: Jan 2 2007 Well she turned it in today to find out it wasn't late after all. It is due at the end of the semester in two and a half weeks. She thought Christmas break was the end of the semester. So all is good and it is early instead of late. Plus we may get the other one back from the art contest and she can still turn that one in too. About four or five years back, my MIL was making these trees as gifts for her kids for Christmas. I was living with her at the time. No joke; she is a great lady and living with her proved it more to me. Any way, these are made out of dowels to desired length, and torn home spun fabric in Christmas colors, a rusty tin star, raffia, and a piece of branch that has been cut on a band saw and drilled in the middle to accommodate dowel. I can't find the original instructions or I would post them. The strips of fabric are just tied around the dowel and they get shorter and shorter as they approach the star. I think they came out real cute and would be cute in other colors and fabric too. The neat thing about homespun is that it has no right or wrong side to the fabric, so it does work a little better for this project. It is trendy right now to have a stripey blanket. I know it is on about five other blogs, just can't remember where. Well you can see ours on the sofa in the back by the big Christmas tree. I made that one about three years ago for my husband's birthday present. Each tree requires 1/2 yard of fabric. For three trees, you should have three different plaids that go well together. The fabric should be printed on both sides; homespun works best. The trees look best if the fabric is torn, not cut, into strips. Dowels are approximately 7/16 inches in diameter and measure approximately 19 1/2 inches, 16 1/2 inches, and 13 1/2 inches in length. All three should be able to be cut from a single 40-inch dowel. Tear the fabric into strips according to the directions below. Start with the longest strip for a tree and tie it to the bottom of the dowel with one single knot. Continue until all the strips have been tied to the the tree -- the longest strips at the bottom, the medium strips in the middle, and the shortest strips at the top. Push all the knots on the tree closely together. Put a little wood glue into each tree base, and then insert the dowel. Tie a few strands of raffia at the top of the tree. Finish by gluing the metal star (available at craft stores or WalMart) in place. Tear thirteen (13) strips, lengthwise, from your fabric. Each strip should be approximately 1 1/4 inches wide. Lay six (6) of the strips side-by-side and cut in three (3) 12-inch lengths. (Note that there is a short area of wastage with this set of strips. If you are doing multiple sets of trees, this wastage can be combined to form usable lengths of ties.) Lay five (5) strips side-by-side and cut in one (1) 12-inch length and three (3) 10-inch lengths. Lay the final two (2) strips side-by-side and cut in one (1) 10-inch length, and four (4) 8-inch lengths. Note that the lengths do not have to be exact, but it helps to be relatively correct. Tear thirteen (13) strips lengthwise from your fabric. Each strip should be approximately 1 1/4 inches wide. Lay seven (7) strips side-by-side and cut in three (3) 14-inch lengths. Lay six (6) strips side by side and cut in two (2) 12-inch lengths and two (2) 9-inch lengths. Again, these lengths do not have to be exact, but it helps. If you are doing multiple set of the trees, you may end up with more fabric, or extra strips; GREAT! (Or, you may want to use a bit more fabric and just cut some extra strips.) The more strips you can get from your fabric, the more full your trees will be. However, be aware that narrower strips than 1 1/4 inches are too small and don't look very nice on the finished project. I received this pattern from a leader when I made a set of three trees at a Church women's homemaking activity. The set of the trees, accompanied by the book "The Legend of the Three Trees," retold by Angela Elwell Hunt, were given as a gift to each of my children for the Christmas of 2002. A wonderful Christmas and a joyous New Year to you and yours. Please click on the first photo to see how cute these really are. Here are some other angels my grandmother made. She made these when I was a little girl in the 70's. For years and years they hung on doors or stair posts. She doesn't have rails; just two big posts. A few years back she stopped hanging them. I asked what happened to them. She offered them to me since I missed them. I need to re-stuffed them as the stuffing is all gone from their necks, which is probably why she stopped using them. I still remember her sitting at a sewing machine making these. Very few times in my life do I remember my Vavo sewing. These 3 angels a doll and some soft ornaments my cousins and I stuffed are all I remember although I know she sewed a lot when she was younger. I also own some of this same type of ornament (stuffed ones) that my grandmother Campbell made. They are all very 60's and 70's in appearance, but I love them all and, wow, she used cotton not polyester; way cool. I hate polyester. I now own all of these items. In time I might make a wreath with the ornaments; have not decided what to do with them. So they sit in a bag in my sewing room. If you noticed that my blog wasn't published for a few days, it is because our hard drive crashed over Christmas. This gift is mostly for my oldest daughter to do when she gets better at cross stitch. 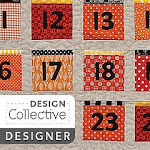 But, there are a few patterns in it that I might want to do for Christmas (not this year, of course) and a few for the 4th of July that look neat to me, too. There are a few Easter items that are simple enough that I think she can start with those real soon. As promised, here are a mass (no pun intended) of angels that my grandmother made. We actually have more of these in the house; they are in the attic, still in three separate boxes with my kids' names on them. They will stay there for many more years as they are not mine, but my children's. She, my grandmother, gave me some for them so when they grow up they will have items their Biz Avo (great-grandmother) made for them when they where little. It is unique for children these days to know their great grandparents. Ours are lucky and know three. None of them are married to each other; one is my grandmother, the other two come from two different sides of my husband's family. All are well into their 90's. They are such different people, it is fun knowing them all. It is sad to say that I hope they, my children, will be old enough to have memories of such great, loving people when they grow up. I could not ask for my children to have better great-grandparents than those they have. It is Christmas! I am wishing everyone a day full of loved ones and good feelings. Tonight, in the city of Bethlehem, Christ Our Savior was born. 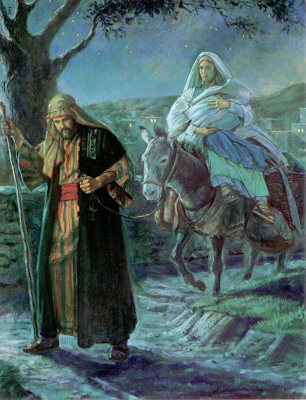 With only his mother, Mary, Joseph, and the cattle and oxen to first welcome him there. He came to a lowly stable, because he descended to the lowliest place on earth so he could rise to be great. 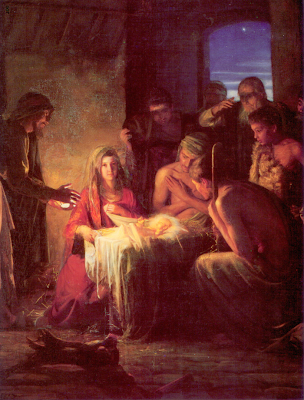 The birth of our savior was the most wonderful event that has happened here on earth. He was born of an earthly mother, with a God for a father. He is truly the Prince of Peace. Heavenly Father gave us the greatest gift ever given, the gift of His son, Jesus Christ. He came to save us all from our sins. He came to give us Eternal life if we seek it. He has come to free us, and He will never leave us. Let us not ever leave Him. And so our Journey has come to an end. Our family would like to thank yours for letting us share the true meaning of Christmas with you. We hope you have enjoyed the journey to Bethlehem. Thank you for letting our family serve your families at this holiday season. We wish you all a Merry Christmas and a very Happy New Year. May the Prince of Peace be with you, this year and always. Here is our baby Jesus from last year. Now the set is complete, and it is Christmas Day. This is the card I got from Darri at Pyglet Whispers. She hosts a blog -- very nice little advent tree thing happening right now. She is all the way over in Australia; funny, I forget how far away people are at times. The Internet makes the world seem so small. More about the card... it is hand made, as you can tell. 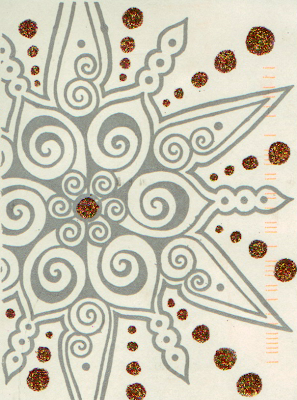 It was a post card; it actually has drawings on both sides. Sometimes I wish postal machines where people and not machines. I hate what the machines did to this lovely card! I still love the card; just not happy with the pink bar code. Now when Jesus was born in Bethlehem of Judaea in the days of Herod the king, Behold, there came wise men from the east to Jerusalem, Saying, Where is He that is born King of the Jews? For we have seen His star in the east, and are come to worship Him. The First Wise man was Balthazar; his gift to the Christ Child was Frankincense. Frankincense is a fragrant, resinous exudation of various species of Boswella. It was imported into Judaea from Arabia. It is an ingredient in the holy incense for sacrificial purposes and was highly valued as perfume. 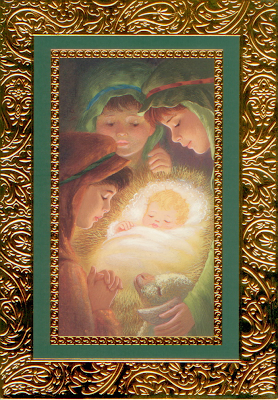 The Second Wise Man was Melchior; his gift to the Christ Child was Gold. His gift was used to help Mary and Joseph to go to Egypt with Jesus when Herod was searching for him. Gold was very valuable. The Third Wise Man was Caspar; his gift to the Christ Child was Myrrh. Myrrh was used for embalming. It was obtained from various thorny shrubs of the dry districts of Arabia and Eastern Africa. 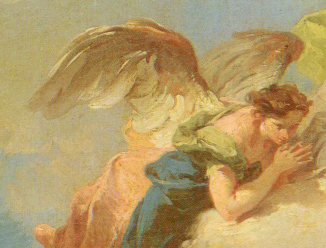 Myrrh is the gum of the rockrose. It is Christmas Eve, the day my family gets together to celebrate the coming of the Savior of all. 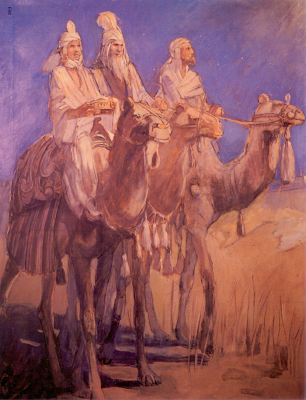 Here is our three Wise Men from last year. Don't forget these all come together as a set, plus any animals and the such that go with them. I got this lovely package on Wednesday, the 20th of December. What lovely glass, Mother of pearl, jet and plastic buttons. A great variety in my favorite colors: black, red, and white. And there were in the same country shepherds abiding in the field, keeping watch over their flock by night. And, lo, the angel of the Lord came upon them, and the glory of the Lord shone round about them: and they were sore afraid. And the angel said unto them, Fear not: for, behold, I bring you good tidings of great joy, which shall be to all people. For unto you is born this day in the city of David a Savior,which is Christ the Lord. And this shall be a sign unto you; Ye shall find the babe wrapped in swaddling clothes, lying in a manger. And suddenly there was with the angel a multitude of the heavenly host praising God, and saying, Glory to God in the highest, and on earth peace, good will toward men. And it came to pass, as the angels were gone away from them into heaven, the shepherds said one to another, Let us now go even unto Bethlehem, and see this thing which is come to pass, which the Lord hath made known unto us. And they came with haste, and found Mary, and Joseph, and the babe lying in a manger. And when they had seen it, they made known abroad the saying which was told them concerning this child. And all they that heard it wondered at these things, which were told them by the shepherds. But Mary kept all these things, and pondered them in her heart. And the shepherds returned, glorifying and praising God for all the things that they had heard and seen, as it was told unto them. Wishing all a joyous holiday. Here is our Shepherd from last year. 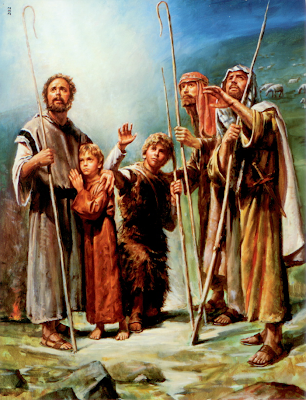 If you noticed, the completed nativity is shown at the bottom of the Journey page for the Shepherds. But I am still going to show one a day 'till we get to baby Jesus. Just thought I would let you know what it looked like all together. Button Mosaic, originally uploaded by sunshine's creations. These are all gifts from " Miss Bee Haven " on the MJF forum; such a wide variety of color materials and styles! There are mother of pearl both buttons and buckles ,big and little. 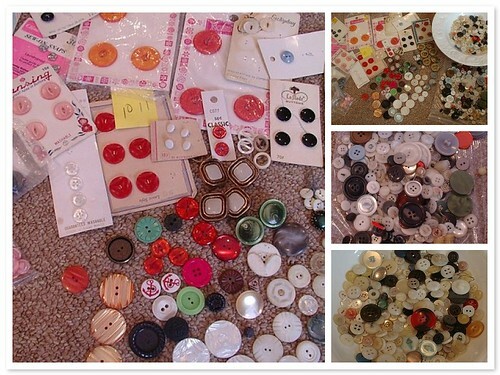 Lots of really cool vintage-patterned buttons; and I love the wild colors. I have yet to sit down and go through all of them, but I pulled out the first few that caught my eye and set them out so they could be seen better in the photos here. Such fun I am going to have with this. I got these on the 18th I am just a little slow posting, with the holiday and all. The angel was the first to announce the birth of our Savior, Jesus Christ. 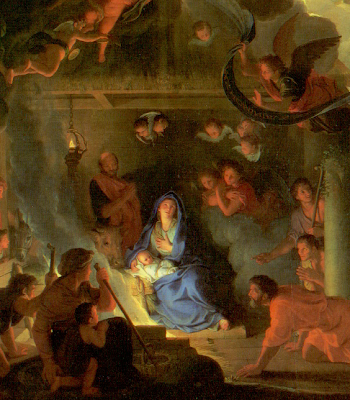 A host of heavenly angels were singing praises unto the newborn King. "Hark the herald angel sing, glory to the newborn King. Peace on earth, and mercy mild; God and sinners reconciled. Joyful all ye nations rise; Join the Triumph of the skies with angelic host proclaim, Christ is born in the Bethlehem. 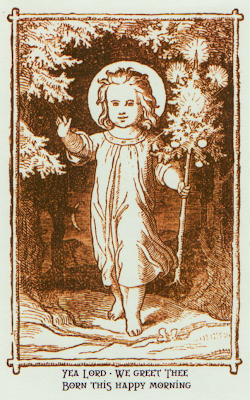 Hark the herald angel, sing glory to the newborn King." Joy to the world, the Lord has come. Let earth receive her King. Let every heart prepare Him room, and heaven and nature sing, and heaven and nature sing." " Silent night, holy night, all is calm, all is bright. Holy Infant so tender and mild, sleep in heavenly peace. Sleep in heavenly peace." My children made this Creche last year; we have three of them on our tree. I think it is just precious, even if baby Jesus is made out of a Popsicle stick. Don't forget in all the rushing around to spend time with your children. They are the closest you can come to being with angles without being in heaven. Here is our Angel from last year. Here is a sample of a few of the cards we have received thus far this year. The wreath is so full you really can't even see half of them in this photo. The sheep were out in the fields that night, while the shepherds watched over them. 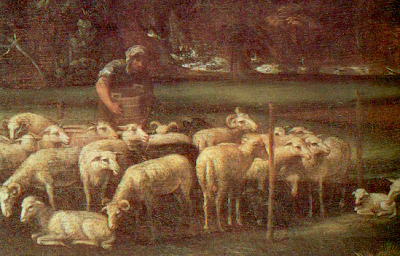 The sheep represent us, as children of our Heavenly Father, and Jesus Christ is our Good Shepherd. The sheep followed the shepherds to the stable to worship the newborn King. Before Jesus was born, they would sacrifice the firstlings of the flocks. That was in similitude of the Only Begotten Son of the Father. After Christ's birth, this kind of sacrifice was no longer needed. Let us be like the sheep on that night that followed their shepherd. Let us follow our Savior, Jesus Christ. Here is our sheep from last year. 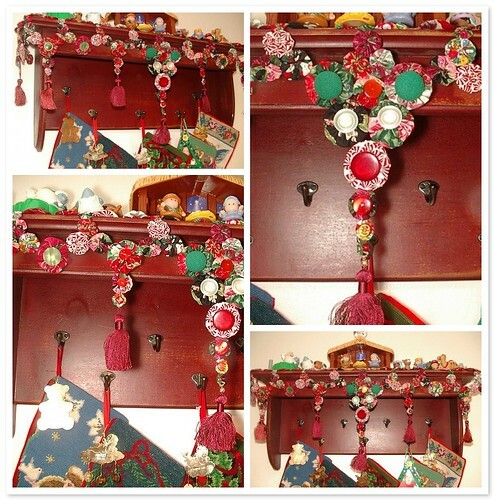 2006 christmas garland, originally uploaded by sunshine's creations. A little while back I was talking about all the advent and garlands in blog land; well, here is mine. I'm almost done with it; a few more need to be sewn on the right side, but they may wait until after Christmas. I'm too busy to finish it now. Just wanted to post it before the holiday. Made from 3 sizes of yo-yos buttons and tassels, two colors of tassels -- it is hard to see in photos. I thought the shelf below which we hang our socks was too plain ,and I needed something long to fill the space up. Thus this idea. This actually isn't all the way finished; it needs a few more yo-yos on the right side; that is why there are no photos from that angle. If you want to see the shelf before garland go here. All the supplies are gathered; it just needs to be assembled. Hopefully, this will fill in the vacant space above our socks. Well, they are all made! Now to get the other supplies and get this garland swag thing made. 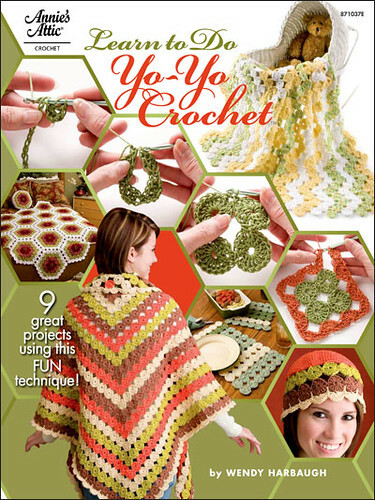 There are three sizes of yo-yo: your standard cd template, a mini cd template, and, lastly, a tinker toy I used for the littlest template (but a silver dollar would work just as well, maybe even a 50 cent piece). 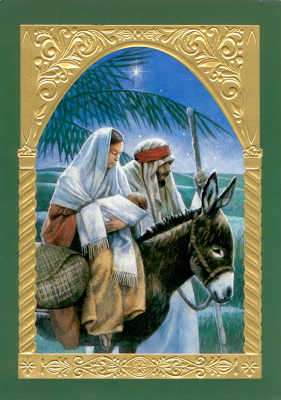 When Joseph and Mary traveled to Bethlehem, Joseph guided the donkey with care. Mary rode upon the donkey's back. Custom was that the wives were to walk, and their husband's rode upon the back of the donkeys. The kids are getting out of school and are excited for Christmas. My kids Christmas Tree " A Tree of Love"
WIP Not in the Spirit of the season.